There’s nothing worse than needing to suffer through Feb. 14 every year, with social media, stores and your friends constantly reminding you that you are yet again hopelessly single. Well, actually there is — a text from your parents reminding you that you’re hopelessly single. This is the parent that (genuinely) believes that their child is their best friend. They go out of their way to text you updates about themselves throughout the day, such as when they’re eating lunch or going to the gym. Their message will try to be comforting but still “cool.” And if you’re especially lucky, you’ll likely get plenty of “here’s what I’m doing now” photos accompanying these messages. But hey, at least someone cares about you enough to relay every single detail of their life to you. Ending a “hahaha” with a period may be slightly awkward, but you have to commend the effort. Gushy texts aren’t everyone’s forte. But then again, neither is your ability to find a Valentine. This is the parent that refuses to believe that their now 21-year-old child is no longer the toddler they dropped off at preschool every morning. This usually results in texts professing their limitless love and exclaiming their pride for how far their baby has come. These texts always include key words such as “adult,” “grown-up” and “proud,” and they are prone to excessive love heart emojis and kisses in the form of “x”s. They also definitely wouldn’t be complete without an “I love you” at the end. Probably the only one you’re getting this V-Day. This is the parent that has always pushed you in school. They were ecstatic when, at age five, you told them you wanted to be a lawyer. You can thank them for their countless hours of attending parent-teacher conferences, helping you with homework and pouring money into your tuition so you can graduate debt-free and buy your first apartment at 24. Glass ceilings don’t break themselves, but at least let the “cute guy in accounting” buy you dinner with the extra dollars he makes working the same job. This is the parent that tries to “get with the times” and learn the lingo that the “kids are saying these days.” They have a Facebook account where they awkwardly share memes that don’t really make sense and poke you like it’s still 2010. 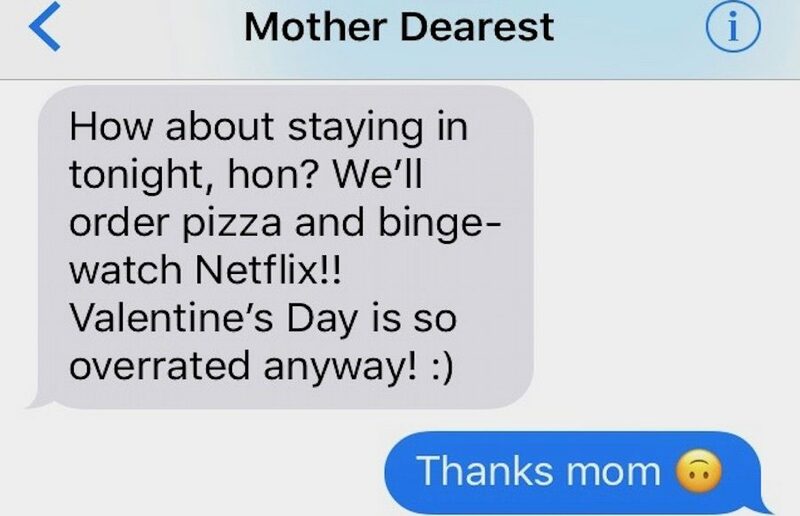 This parent will abbreviate anything and everything they can get their hands on, and they’ll definitely use words such as “awesome” “cool” and “bro” because they obviously still have game. After a a text like this, maybe a few drinks don’t sound so bad. Ouch. That’s all we have to say about that. Texts from parents are simply pure gold. Maybe it’s worth being single this Valentine’s Day just so you can receive one of these beauties.